For details from the Fresh Sound website, click here. It’s possible that some readers might be unfamiliar with the Keynote Records catalogue, so if the tiny portraits above don’t pique your interest, here are a few words. Between 1941 and 1947, with the bulk of its sessions taking place in 1944-6. this independent jazz label produced a wide sampling of the best jazz records ever made — from the New Orleans jazz of George Hartman to the “modern sounds” of Lennie Tristano and Red Rodney. Keynote was the expression of one man’s intelligent taste — the Javanese jazz fan and producer Harry Lim (1919-1990). Lim’s records neatly balance written arrangements, head arrangements, and improvised solos. Many of the Keynote issues were recorded for issue on 12″ 78s, thus giving musicians room to create in more leisurely ways. In fairness, the Keynote sessions were not the only ones taking place in the wartime years: Lim’s issues ran parallel with Commodore, Blue Note, Hot Record Society, Signature, and even smaller labels — Asch, Jamboree and Wax among them. Keynote featured jazz players who were already stars: Coleman Hawkins, Roy Eldridge, Lester Young, Red Norvo, Benny Carter, Sidney Catlett, Teddy Wilson, Johnny Hodges, Slam Stewart, Jack Teagarden, Earl Hines, Count Basie (pseudonymously), as well as improvisers of equal worth who were often not given their due: trumpeter Joe Thomas, Milt Hinton, Bill Harris, Willie Smith, Kenny Kersey, Jonah Jones, George Barnes, Johnny Guarneri, Emmett Berry, Aaron Sachs, Herman Chittison, George Wettling, Hilton Jefferson, Tyree Glenn, Gene Sedric, Juan Tizol, Rex Stewart, Pete Brown, Cozy Cole, Charlie Shavers, Nick Fatool, Bujie Centobie, Irving Fazola, Allan Reuss, Dave Tough, and many others. Three particularly remarkable sessions brought together like-minded but singular horn players: trumpeters Eldridge, Thomas, and Berry; saxophonists Hawkins, Don Byas, Tab Smith, Harry Carney; trombonists Vic Dickenson, Harris, Claude Jones, and Benny Morton. Several things need to be said about the new Fresh Sounds reissue. For one, it is a “European bootleg,” which will repel some collectors of this music, and I think rightly so. However, the Keynotes have never been issued in any systematic way on compact disc — in their home country or otherwise. And the Fresh Sound set concentrates, with a few exceptions, on issued material. I don’t know whether this was a choice designed to entice listeners who find alternate takes annoying, or to keep the set’s price attractive. (I bought mine on Amazon for $94, which seems a good value for 243 sides.) The sound is good, although I haven’t compared it to any 78 or vinyl issues. True Keynote devotees will, of course, have their own copies of the comprehensive vinyl issue of the label’s offerings, and the Fresh Sound box won’t replace that. 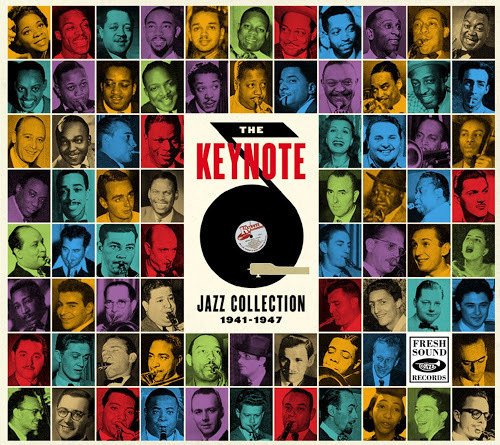 The reissue history of the Keynote recordings is characteristically odd — leaving aside the comprehensive vinyl set — with early vinyl assortments assembled by instrument (trumpet, trombone, or saxophone), then later ones featuring stars Hawkins, Young, Woody Herman sidemen, Norvo, Tristano, etc. As I write this, I am taking great pleasure in the sixth disc — selected at random — hearing sessions led by Barney Bigard, Horace Henderson, Bill Harris, Willie Smith, Corky Corcoran, and Milt Hinton — a fascinating cross-section of timeless jazz recorded in 1945. “Fresh Sound” is an apt description for these sides recorded more than half a century ago. I think I got more than my money’s worth. You might agree. This entry was posted in "Thanks A Million", Bliss!, Generosities, Hotter Than That, Irreplaceable, Jazz Titans, Pay Attention!, Swing You Cats!, The Heroes Among Us, The Real Thing, The Things We Love and tagged Aaron Sachs, Allan Reuss, Benny Carter, Bill Harris, Bujie Centobie, Charlie Shavers, Coleman Hawkins, Count Basie, Cozy Cole, Dave Tough, Earl Hines, Emmett Berry, Gene Sedric, George Barnes, George Wettling, Harry Lim, Herman Chittison, Hilton Jefferson, Irving Fazola, Jack Teagarden, Jazz Lives, Joe Thomas, Johnny Guarneri, Johnny Hodges, Jonah Jones, Jordi Pujol, Juan Tizol, Kenny Kersey, Keynote Records, Lester Young, Michael Steinman, Milt Hinton, Nick Fatool, Pete Brown, Red Norvo, reissue, Rex Stewart, Roy Eldridge, Sidney Catlett, Slam Stewart, Teddy Wilson, Tyree Glenn, Willie Smith. Bookmark the permalink. Another bootleg issue from Spain! there is a special alcove in Hell (I am told) for “critics” who deem a recording featured extended solos by both Hawk and Joe Thomas a “fiasco”.